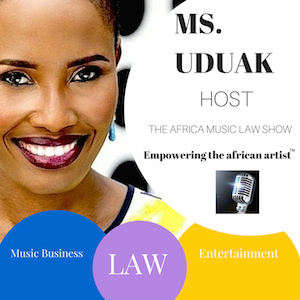 Ade Olufeko joins Ms. Uduak on the 113th episode of The Africa Music Law Show to discuss the future of music technology in Nigeria’s music industry. “Ade Abayomi Olufeko, a product of the pre-dot-com era is an American trained technologist, commercial designer and international curator of Ijebu descent. The intersection of his expertise in different domains led to the 2007 formation of Visual Collaborative, a 360 festivals platform for humanities and innovation. He presently serves as its Chief Platform Strategist. He also serves as a management consultant in cognitive design for IBM’s Interactive experience and IoT practices. Olufeko has lectured around the world on digital new media and the technology ecosystem as it pertains to the African continent at various institutions, conferences, and festivals. Ade has rendered enterprise and ICT services to various Industries, working with brands such as Adobe Systems, PayPal, Atlantic Records, Bank Of America, Warner Music Group and many indigenous African companies. He is a recipient of the IBM Gerstner Award for client excellence following a computer worm virus in 2003. 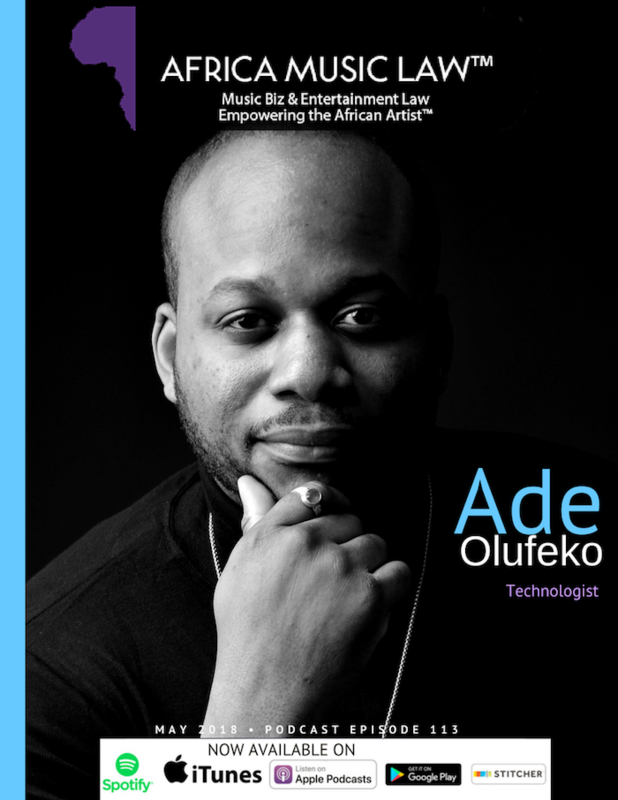 Ade Olufeko on his work as a technologist. Ade talks latest tech trends. Ade talks the discord between Nigeria & Africa’s music and technology industries. Ade discusses some efforts within the entertainment tech space to unify both industries. Ade discusses his personal background and career path. 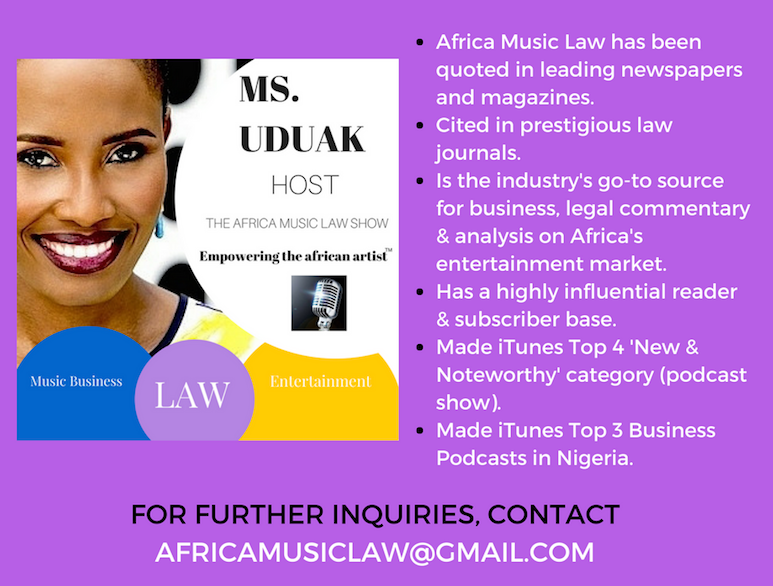 Uduak Oduok (Ms. Uduak), the founder of Africa Music Law, is a Partner and Co-Founder of Ebitu Law Group, P.C. where she handles her firm’s intellectual property law, media, business, fashion, and entertainment law practice areas. 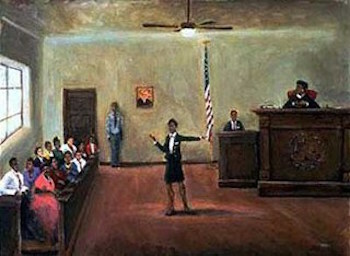 For over fifteen years, as an attorney, she has litigated a wide variety of cases in California courts. She has also handled a variety of entertainment deals for clients in the USA, Africa and Asia including network television and licensing deals. Her work and contributions to the creative industry have been recognized by numerous organizations including the National Bar Association and featured in prestigious legal publications in the USA: ABA Journal and The California Lawyer Magazine. She can be reached via email (uduak@ebitulawgrp.com) or on twitter: @uduaklaw.